Once a royal hunting ground, the forest is now open to all and has been heartily embraced by mountain bikers, runners, riders, and role-players. Others just enjoy the beauty of the beech trees. Every Sunday morning on the S-train to Farum, there’s fierce competition for the bike racks. Hareskoven Forest – actually forests, plural – is popular with cyclists. 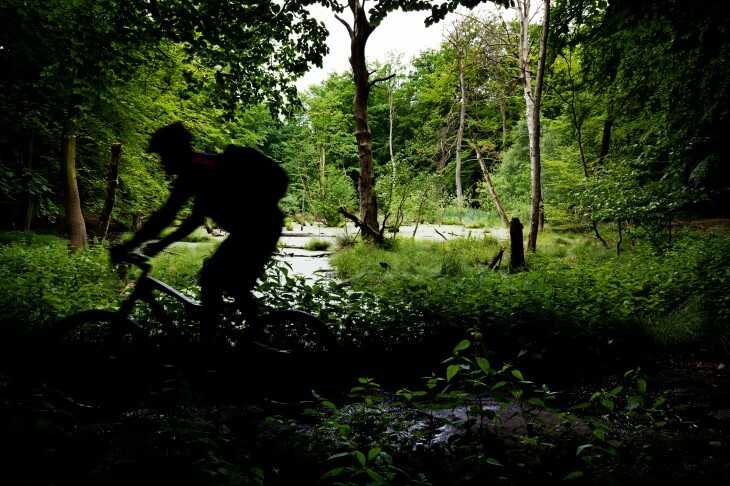 It’s home to Denmark’s first real mountain-bike route. Many more have since been added, but the ‘Red Track’, which runs for 25 kilometres through the forest, still attracts large numbers of cyclists and is suitable for beginners. There are plenty of winding, quirky paths through the trees, as well as straight roads that form the shape of a star. They date from the days of Christian V. He had the paths laid out for riding to hounds, in which the pack would chase its prey until it was exhausted, and the king or guest of honour would finish it off. One of the oldest forests in Denmark, relics of the past abound in Hareskoven, including megalithic tombs and remnants of the Swedish siege of Copenhagen, when it was the site of an enemy encampment. By the time they retreated, the Swedes had felled and destroyed most of the forest,and the effects are still plain to see. Hareskoven is an exceptionally beautiful place to enjoy the Danish national tree, the beech, especially in its springtime coat of lively, neon-green or its golden autumn hues. However, the king of this forest is the oak known as ‘The Tailor’, the largest tree in the area. The undulating terrain in Hareskoven Forest dates from the last Ice Age and has been inhabited since the Stone Age. The many signs of ancient habitation include several megalithic stone tombs. When a railway, now the S-train route to Farum, opened in 1906, a town soon grew up around the station in Hareskovby. A number of conservation orders made sure that the forest was not destroyed by developers. The railway line ran to the long-since unused Lygten station in Nørrebro. Out towards the open plain, 100 new oak trees were planted by Copenhagen’s Muslim community in 2010. Hareskoven’s varied landscape consists of hills, lakes, open spaces and deep forest. The most frequently sighted large animal is the deer. Foxes and badgers are also spotted from time to time. Much of the wetland and the lakes had been drained, as the city used water from the area. However, they are now being restored, and provide habitats for a range of amphibians and rare insects. The forest is now managed in a more natural manner, with fallen trees left for fungi and insects to use. Many of the trails are suitable for wheelchair users. The microbrewery and eatery Bryggeri Skovlyst is in the middle of the area. Hareskoven has plenty of places for picnics and cooking over an open fire.